Finding empirical formula is one of these questions, that are much more often asked on quizzes, than done in the lab reality. But at some stage of chemical educational you have to deal with empirical formulas quite often. Using empirical formula calculator you simply enter known information for each of the elements, and program automatically calculates most likely empirical formula of the compound. Methacrylic acid is a compound of C, H, O. When 0.7629 g methacrylic acid was put into combustion, it produced 1.55 g CO2 and 0.50 g H2O. What is its empirical formula? 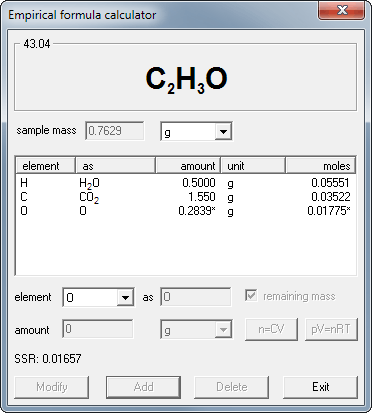 you will just enter mass of the substance, masses of products (as given, no need to convert them to moles, but you have to enter formulas of products), information that whatever is not included in products must be the oxygen (that's just one click) - and program automatically calculates empirical formula to be C2H3O. Fast and accurate. If the information about amounts of products is given in the form of volume and concentration, or ideal gas data, to speed up calculations even further you can enter it using ideal gas calculator or concentration calculator.